Since this weekend was quiet enough to let me relax (after a week of feeling somewhat frazzled) I picked up "Spring for Suzannah" to enjoy along with a nice cuppa! I was looking for something light to read but with a good solid plot, the kind of novel you immerse yourself into. This is a debut for Catherine Richmond but a few pages in the book I knew "Spring for Suzannah" would be a throughfully enjoyable read and I was not disappointed. I think we all agree we like to read about these incredible frontier women who braved the wilderness, tamed the Wild West, raised families, often burying some of their loved ones, faced starvation, wildlife threats, and built a life for themselves along their mates. Let's not forget their contributions in building schools, churches and developing entire towns whilst uphelding God's word! The setting for Catherine Richmond novel (written with the help of a few chocolates along the way - my kind of gal!) is the Dakota Territory, a few years after the end of the Civil War. Suzannah travels outwest to meet her new husband, Jesse. Theirs is a marriage by proxy, not unusual at that time. What is unusual is that she brings uncommon skills to her new way of life. Her new home is a soddy, barely large enough to contain her husband and herself. Her companion is a dog, her only friend is Martha, a Norvegian just learning the English language and she lives miles away. The prairie is everywhere, there are many dangers such as wildland fires and the often weather changes! To survive is a daily challenge, being caught unprepared could mean death. There are no church, no school, no doctor and loneliness has a way to pervade everything! Jesse is a hard worker farmer but also a loving husband who has seen much horror during the War yet believes in God implicitly. His comfortable relationship with the Lord at times is even funny! Shy Suzannah is insecure and lives in fear her new husband will send her back East but with patience Jesse reaches her heart and they soon see their union blessed. When tragedy happens however, Suzannah must deal with the pain and here as always we are reminded God is always by our side. 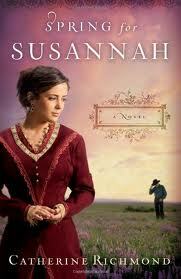 Suzannah matures in a real pioneer woman when she realizes God has a plan for her after all! Catherine Richmond describes her characters as living a full life, theirs is a romance that blooms in a lonely often harsh world. She does not shy from describing their intimacy, reminding us God made all things beautiful and His love is constant. I cannot say honestly I would recommend this as a read for young girls but again, this Christian novel was written with much care and faith and a more mature audience will truly enjoy following Jesse and Suzannah's story. The author's careful details gives us yet again, a little window on these pioneers women who made a New World thus providing us with a bit of history, along with an afternoon of true relaxation. Many thanks Catherine Richmond and I hope you will soon pen another story for us. Thank you for the review! I just entered the giveaway! I'm married to a pilot, too, and my daughter lived in Ecuador for a year. The story of the Saint family is so amazing. I had this idealized view of primitive tribes, living peacefully - oh, how wrong! They so need Jesus to show them how to love and forgive - as do we all! What an honor for Spring for Susannah to share a blog with the story of these missionaries!